1. Preheat the oven to 200°C, gas mark 6. Roast the salmon according to the pack instructions. Meanwhile, using a vegetable peeler, cut the carrot into ribbons, then shred into strips. Cut the grapefruit into segments. (see tip in Kitchen wisdom, far right). 2. Squeeze 1 tbsp of juice from one of the leftover grapefruit middles into a small bowl. Combine the juice with the fresh chilli, to taste. Set aside. 3. When the fish is cooked, cool a little, then remove the skin. 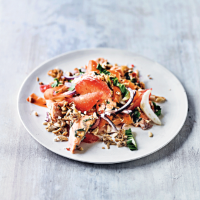 Toss the carrot, grapefruit, onion and pak choi with the grapefruit dressing, then flake the salmon on top. Scatter with the nuts and crispy onions to serve. Cook’s tip A 300g pack Waitrose British Chicken Green Thai Marinated Breast Chunks would work equally well with this salad. 2 of your 5 a day; high in omega 3.